A tree well worth growing for its delicious fruit the Blackboy is a hardy late cropping variety. It is also a beautiful flowering specimen with its blossoms bursting into pinkness in the early spring. Being a deciduous tree it will produce beautiful autumn foliage after the fruiting is over. 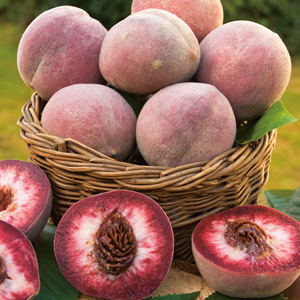 A stunning medium sized peach with a velvety dark wine skin over red and cream coloured flesh. A sweet juicy peach that can be eaten fresh off the tree or used for stewing, pies, tarts, jams and chutney. Freestone. Excellent tree for the home garden. This peach is self fertile (it does not require a cross pollinator). Fruits through-out summer first fruit when tree is 2 years old. Requires a full sun position in a well drained soil. Supplied as a bare rooted tree. Please note, $20.00 Freight fee applies on this item. Not for WA,TAS & NT due to quarantine restrictions. General Information: Some fruit trees (see individual varieties) require cross-pollination with another plant of the same species to enable fruit production to occur. Two trees can be planted in the same hole if space is an issue. Watering: For optimum fruit production trees must to be kept well watered, especially when fruit is forming and ripening. Do not let roots dry out even in their dormant period. Fertilising: An annual application of fertiliser is essential to assist fruit production. Pruning: Prune in winter to a vase shape, this will encourage flowers and fruit. Dislikes: Heavy and water logged soil. Pests: Fruit Flies and Codling Moth, can be controlled with fungicides or insecticides as required. Tips: Protect from the wind and frost when young. Keep the area underneath the tree free of grass and weeds, mulch well area but keep away from the trunk to avoid collar rot. Fluctuating temperatures can cause problems with the pollination of fruit. Bare rooted trees are an ideal way of transporting items that would normally be too heavy and bulky, during a time when there is very little stress or damage to the plant. Deciduous trees shut down during winter, so this is an ideal time to dig them up and send them out. These quality trees are grown for two years from a planted or grafted tree, so plants are between 1 metre and 1.8 metres tall with a number of branches. For tree seedlings, plants are up to 1 metre tall, and have no branching. When Your Plants Arrive: Undo the parcel carefully and place the roots in tepid water and soak overnight or at the very least, a few hours. Inspect the roots thoroughly and if there are any that are ragged or broken, trim them with a sharp pair of clean secateurs. Plant the following day; do not let the roots dry out. If the plants arrive in advance of your desired planting time they should be heeled-in. If there is more than one plant to trim, dip secateurs in a solution of bleach and water, or methylated spirits or the like to disinfect them before using them on the different plants. Heeling-in: To keep bare rooted trees longer than a few days they should be “heeled-in”. Select an open space in the garden, dig one large hole and plant all your bundled bare rooted trees in it and firm down soil. Water in well. They will keep for several weeks if kept watered. Alternatively, plants can be placed into moist potting mix or potted up until a permanent place is ready for the plant. *NOTE: IT IS MOST IMPORTANT NOT TO LET THE ROOTS DRY OUT AT ANY STAGE OF PLANTING. Planting: The ideal time for planting bare root trees is during the winter months. Please note, generous watering will be necessary for the first few months until the plants have grown sufficient roots to sustain the foliage. If normal winter/ spring rains are light make sure plants receive supplementary watering- this may mean a bucket of water per day every day until the plant has grown foliage. Check the moisture level around the roots to ascertain if this is required. It should be moist, but not wet at all times. The proposed bed should have been dug over many times prior to planting ready for the plants. A thorough cultivation at the time of planting is a bare minimum. Dig a hole twice as wide as would be necessary to take the roots, and a little deeper, then lightly fill some of the hole in, leaving a mound on which to spread out the roots, which should be placed down and outwards over the small mound at the bottom of the hole. Cover with soil and firm down moderately. Water in well. The bud graft or bud union (if evident) should remain approximately 5cm above soil ***except for Lilac trees where the graft MUST be planted well below the soil to avoid the rootstock growing through. If planting in an area with clay soils, be sure not to dig into the clay, rather build up the garden bed with topsoil, as clay will not allow water to drain away, and will result in the tree roots ‘drowning’. CARE MUST be taken at planting time with the addition of fertilisers, as this may burn the roots. However, the addition of slow release fertiliser in a planting tablet form is beneficial. Watering: Once the roots are arranged and settled, cover with soil and firm gently. Make a small depression around the tree to stop the water running away, or alternatively use a tree surround to create a well for the water to stay within proximity to the roots. Water thoroughly to settle the soil around the roots. Fertilising: Fertilise once the plant has its full foliage.